Just for fun (again) I thought I'd post questions which occurred to me while watching the The Empire Strikes Back DVD I recently received after having my enthusiasm for the Star Wars movies renewed by my recent attendance of Star Wars in Concert on November 7th here in Charlotte. First, a minor observation: Darth Vader's helmet is sure a lot shinier in this movie than it ever was in the first one. Did Carrie Fisher really look older in this movie (about three years after the original) or is her older look mostly a deliberate thing because of the darker theme of this movie? I wonder how today's younger audiences feel about the stop motion scenes of the tautans and the walkers. They still look great to me — but then I've been a fan of stop motion for over half a century. Was the running joke about the repeated failure of the Falcon's hyperdrive really funny, or was it just annoying as hell to Star Wars fans who desperately wanted to see that famous "jump" to light speed again?. Muppet Yoda versus CGI Yoda: After watching Empire again for the first time since seeing The Phantom Menace, Attack of the Clones, and Revenge of the Sith, I've decided that I greatly prefer the Frank Oz version of Yoda to the CGI version. Anybody agree? The "special edition" of this movie has, of course, replaced the image of the Emperor that was originally shown with the face of Palpatine. Am I the only one who thought the voice of the original Emperor sounded like Alec Guinness? For those folks who call the Star Wars movies "simplistic" — can you really claim that about them by the time the story gets to the battle between Luke and Vader in this movie? It might not contain deep mega-scientific concepts which rival Forbidden Planet, but it was never really meant to do so! 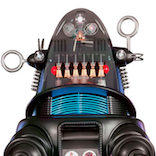 This was science fiction with an accent on melodrama — not mega-science. What do you guys think? What was Vader really tying to do during the light saber battle? He seems to act inconsistently. One minute he's trying to do the carbon freezing thing, and shortly after that he's trying to cut him to pieces on the catwalk just before he lops off his hand! Am I the only one refused to believe Vader's claim to be Luke's daddy when he first heard it? I figured it made more sense to assume that Vader was a big fat liar just tying to confuse the noble son of Skywalker! And finally this shocking but sincere question: Was I the only one who shouted "What?" right there in the theater and sat with his mouth hanging open when the end titles started running because he didn't realize the move was OVER? Seems stupid now, but at the time it actually caught me by surprise. Yep, I did notice that, way back. The emperor must have approved a refurbished outfit to encourage Darth after the setback in A New Hope. Second, a deeply psychological comment: Ain't if funny how that long, passionate kiss which Leia gives Luke when he's in the hospital seems kinda gross in view of the fact that she's lip-locking with her brother? Yuck! Did Carrie Fisher really looked older in this movie, about three years after the original — or is her older look mostly a deliberate thing because of the darker theme of this movie? She did look older to me. In fact, along with the change to Luke, all the characters & the settings seem to be a decade later after A New Hope, not just 3 years. Was the running joke about the repeated failure of the Falcon's hyperdrive really funny, or was it just annoying as hell to Star Wars fans who desperately wanted to see that famous "jump" to light speed again? Annoying. Especially in the theater back in 1980. No, I thought the same thing back in 1980. When I first saw this, my thought was 'omg — the Emperor is a clone of Kenobi!' — the image also looked like Guinness to me, in shadow. We had already heard, by that point, about the past Clone Wars. I figured, all this weird stuff happened during those wars, such as clones of heroes taking over and assuming positions of villains. 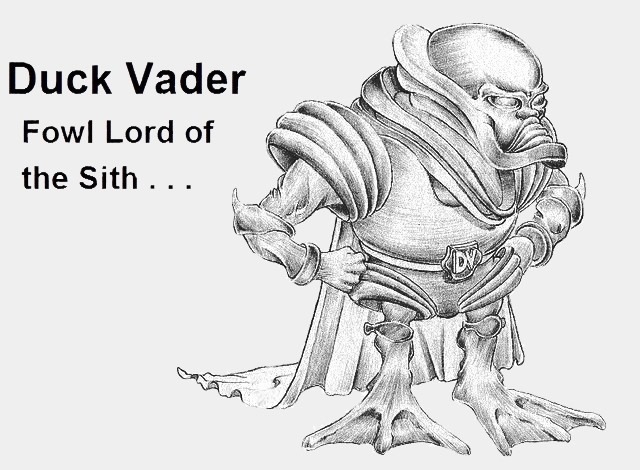 Vader was then a clone of . . . ? Anyway, all that theorizing is down the gutter now . . .
My take on it: Vader was still trying to keep Luke alive and was holding back during most of their lightsaber battle. Though it may look like he was trying to cut him to pieces on the catwalk, it was more for show — Vader had the skill to control his blows so that it just looked vicious. When Luke struck him on the shoulder, it angered him and he lopped off Luke's hand. Am I the only one who refused to believe Vader's claim to be Luke's daddy when he first heard it? I figured it made more sense to assume that Vader was a big fat liar just tying to confuse the noble son of Skywalker! I was ready for more revelations in Return of the Jedi, like . 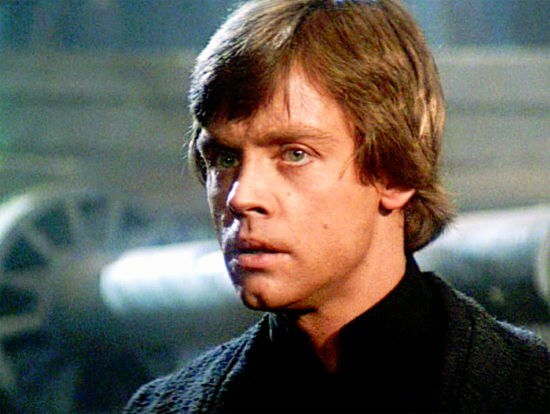 . . Vader was a clone of Luke's dad (Emperor was a clone of Obi-Wan, see? etc.). Didn't happen, of course. The weakness of almost any middle film in a trilogy. The films don't really end . . . Regarding Luke and Leah kissing.....I seriously doubt that at this stage it had been decided to make them brother and sister. For all the talk from Lucas about having the story all planned out waaaayyyyy ahead of time, I would call that b#@& s@*#!!!! He may have had a general line of thought about some events . . . but not really finer than that. Remember, during preproduction that Luke was originally a woman! I think that at THAT time, any romance was to come from the paring up of Luke(tte?) and Han. I remember Lucas saying after Star Wars came out that he was envisioning more films than what he had made and later he was saying that he never said that. No, I think the Luke and Leia kiss was intentional as even Lucas didn't even know that they were going to be related. As I remember, and of course I am probably wrong . . . but I really got the impression that in the first movie it was intended that Luke and Leia were going to be matched up. They ALL look much older in the second film (and of course the third) and I figured it was because Hamill had that really bad car crash that tore up his face . . . and Fisher was really swimming deep in the drugs she was into, and Ford (being the oldest of the trio) was just starting to show his age. That whole thing with the Falcon's not functioning hyperdrive WAS annoying! Going from a Falcon that was a hot ship in the first movie to a junkpile was a bit of let down. 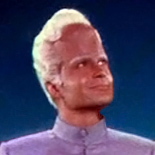 I agree that the Emperor looked like Guinness to me as well. I thought there was something going on with all that that would turn out to be something to do with Kenobi. I thought that each movie was trying to outshow the preceding with more and more effects (and not always better mind you). I was annoyed at Lucas for introducing the Ewoks and trying to make a Vietnam analogy. Simplistic drivel. Actually, I prefer the prequels to either of the two original Star Wars sequels. You know, I wasn't all that crazy about The Phantom Menace and Attack of the Clones when they first came out, but after seeing the perplexingly popular The Force Awakens, with just a few troubling little similarities to the "Hope" and "Return" . . . well, suddenly, the prequels seem refreshingly original. I mean, come on, guys. "Luke" is now a girl after all. There's another "evil empire" and "rebel alliance". The planet Jakku is indistinguishable for Tatooine (both planets use the same photo of twin suns in each of their travel brochures ). And then there's Supreme Leader Snoke who is — well, if it looks like a Darth and it quakes like a Darth . . . Nothing subtle about that comparison, eh? I guess I had trouble accepting the character because I kept thinking about the funny sketch I did, years ago. A thirty-something computer tech at Best Buys I spoke with recently said he really loved The Force Awakens, and he told me why he thought it was so good. He was of the opinion that Lucas hadn't just "lost it" (creative-wise), he said Lucas never had it to start with. He felt like A New Hope (written and directed by Lucas) was "all right", but the subsequent films (according to him) got better and better as Lucas became less involved. And now this newest one was 100% someone-other-than-George, so it was just terrific. Hmmm . . . I don't think I agree with that. I'm not sure I believe all of these, but here's a few interesting trivia items from the IMDB (in blue text, below). When shooting on location in Finse, Norway, a fierce snow storm hit the hotel where the cast and crew were staying. This would have normally halted filming, but director Irvin Kershner thought these weather conditions were an excellent opportunity to film the scene where Luke wanders through the snow after escaping the Wampa cave. 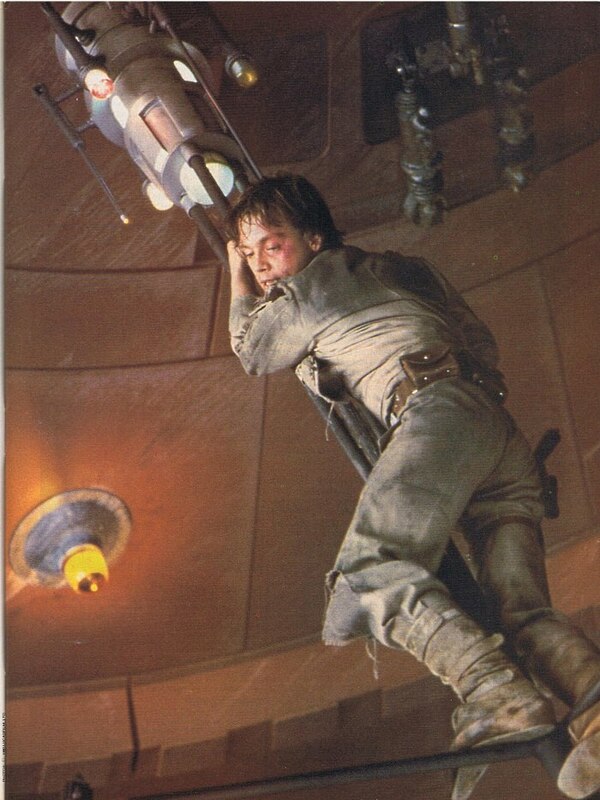 He did this by sending Mark Hamill outside into the cold, while he and the cameraman stayed and filmed inside the hotel's front hall. Note from me: I could be wrong, but this sounds bogus. Do the shots in this scene of Mark look like they weren't fairly close to the actor when they were made? When Mark Hamill was having trouble with the Dagobah scenes with Yoda, Frank Oz brought in Miss Piggy to make him laugh. Note from me: Boy oh boy, would I love to see THESE outtakes! An oft-quoted myth is that the Wampa attack on Luke was devised to explain the actual scars on Mark Hamill's face because he had been involved in a car crash and had to have reconstructive surgery. 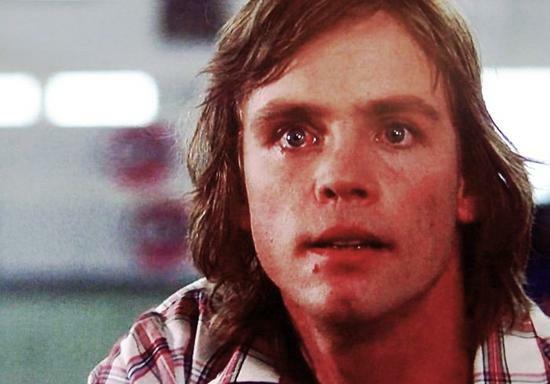 Hamill did indeed survive a serious car crash in January 1977 but did not have any visible scars by the time Empire began filming over two years later. Note from me: Forgive me, but I ain't buying this one. 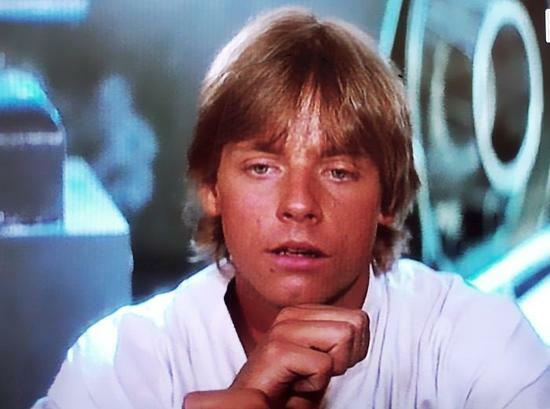 Poor Mark's face is so different from his pre-crash appearance in A New Hope that I firmly believe that this "rumor" is true, and I'm sure that the movie Corvette Summer was made to introduce Mark's "new" face to the public before The Empire Strikes Back came out. I, for one, was shocked by the difference in the poor man's face. George Lucas initially called this the worst Star Wars film, and apologized for its existence. He changed his mind after he found out some people believed it was the best Star Wars film. Note from me: Well now, ain't that odd? This is my own least favorite of the original three, but several of my friends think it's the BEST of the three. In the Hoth command center, Han makes a reference to "That bounty hunter we ran into on Ord Mandell". 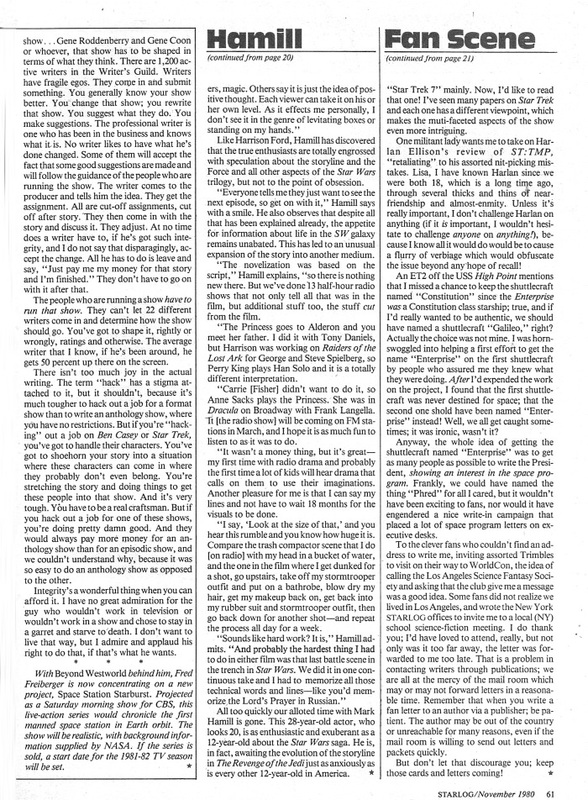 An audio drama based on this, "Rebel Mission to Ord Mandell" was released in 1983 as an NPR radio drama, and later on 33 1/3 LP. It featured the voices of many of the original cast. Note from me: I was very disappointed in the NPR radio version of Empire Strikes Back. Compared to the one for A New Hope, it was just a rehash of the movie, using fewer of the original cast, with a much shorter running time . . . and with the worst "Yoda" imaginable, played by John Lithgow! Intertesting points, but as I often say about what revelations come, I always say "It's how the writer makes it come out.". We'll see that in action in THE LAST JEDI when Rey turns out to be a Kenobi, not a Skywalker. As to the story about the hotel, it's true. Basically, the crew was stuck at the hotel due to weather, but Kirsch got the idea to shoot some of Luke stumbling through the blizzard. 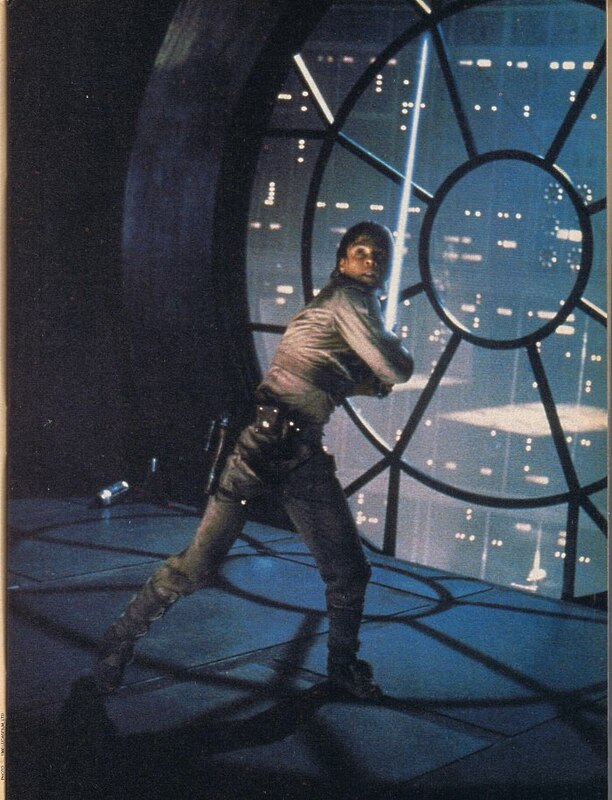 They opened a door, pointed the camera out, had Hamill run out into the weather and stumble back towards the camera. Soon as "cut and print" they got him right back inside. They opened a door, pointed the camera out, had Hamill run out into the weather and stumble back towards the camera. Soon as "cut and print" they got him right back inside. Ah-ha. Okay, I get it now. Thanks. I posted a fan-made trailer for The Last Starfighter (1984) on the thread for that movie, and the trailer had this amusing message at the beginning. I wondered just how true the claim at the bottom was, so I made a list of 1980s science fiction films that I thought were good, just to see if that decade really did produce a significant number of “the best” sci-fi movies. This movie is on the list I made. I know what I like about the film (and a few things I don’t like), but I’d like to hear the pros and cons from the rest of you folks. So, what do you think, guys? 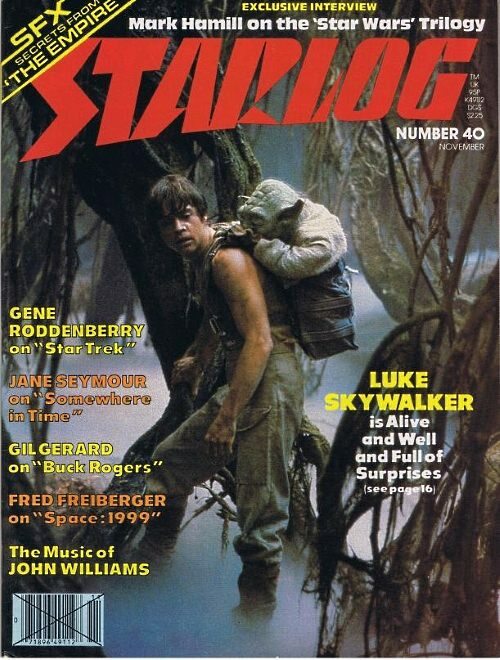 Enjoy this well-written interview with Mark Hamill in Starlog from issue 40. I really enjoyed this article, but Mark Hamill made a statement that I find hard to believe. He insisted that the only thing which happened to his face in the accident he had after filming Star Wars was a broken nose. He denied that any reconstructive surgery had to be done on his face. 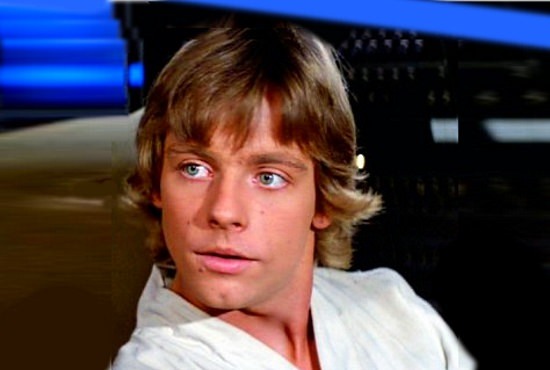 When I saw Corvette Summer in 1978 I was shocked by how different Mark Hamill's face looked! His nose was noticeable smaller, the distance between his upper lip and his nose was larger, and his upper lip looked puffy. We all know that a broken nose causes a bump in the cartilage that makes the nose look a little larger. It certainly doesn't make it look shorter from the bridge to the tip! Obvious Mark had a nose job, either by choice or by necessity. On-line articles do say that his nose had to "repaired using cartilage from one ear", but I'm still curious about how extensive the injuries really were, and those on-line articles I mentioned all say that there seems to be no one official story, not to mention lots of fan "legends" about how horrible the accident was and how badly he was injured. Anyway, here's a few photos for comparison. Here's another fine Starlolg article from issue #18. 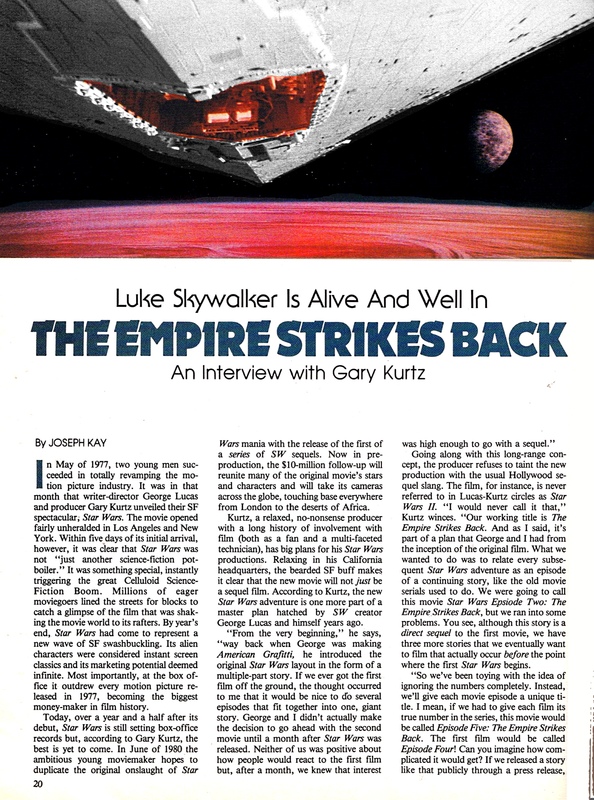 The interview with Gary Kurtz by author Joseph Kay is exceptionally well written, and it starts with a wonderful description of just how Star Wars rocked the world the year is was first released. 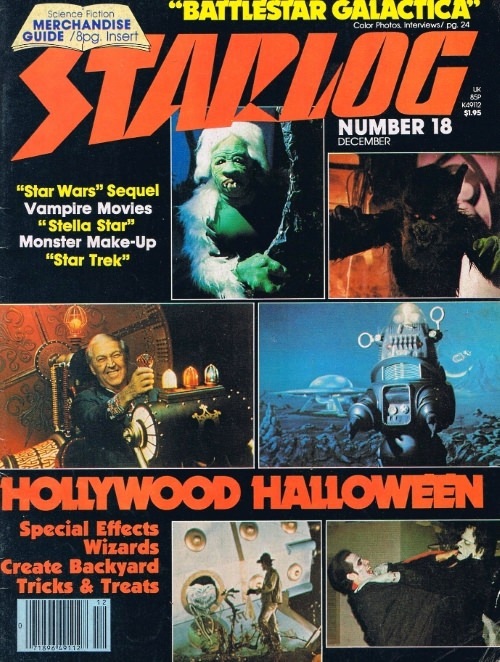 Recapturing the memories of that magical era is good reason for reading this Starlog article. 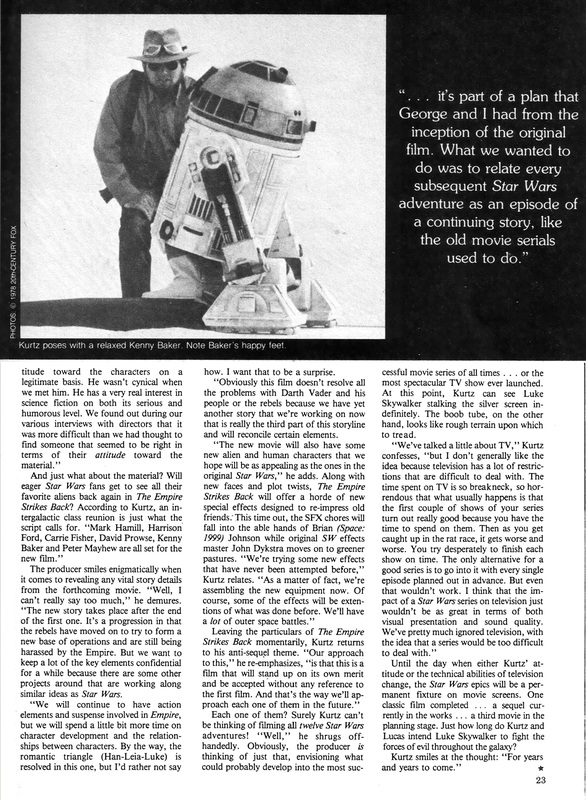 And the fact that the article presents the hopes and plans for the second Star Wars movie when it went into production is especially fascinating! 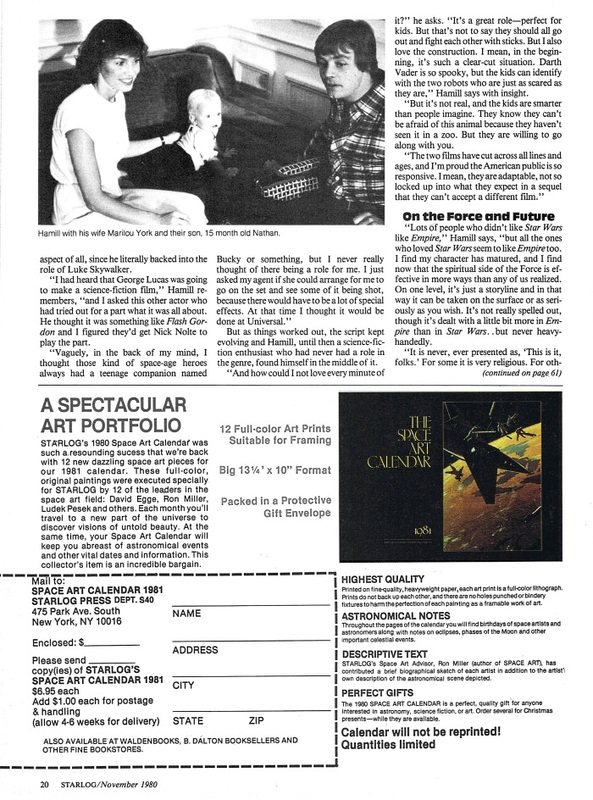 This article recalls the excitement we all felt when the first sequel to Star Wars was something we all waited for with breathless anticipation! Relive your youth and the excitement you felt when Star Wars was a world-wide phenomenon and you could barely wait to get in line to see the next installment in this amazing science fiction experience! 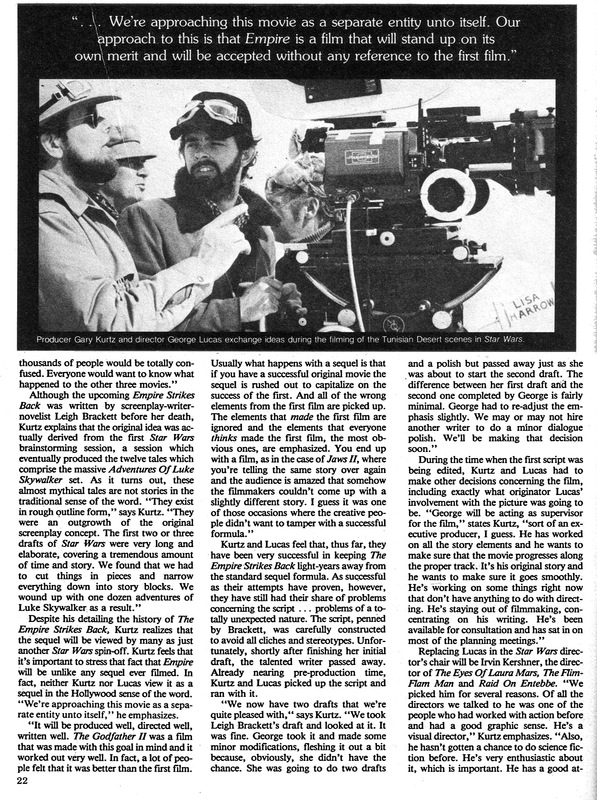 It’s interesting to read an article about The Empire Strikes Back which was written during preproduction and to learn what fans knew about the sequel or hoped it would include. 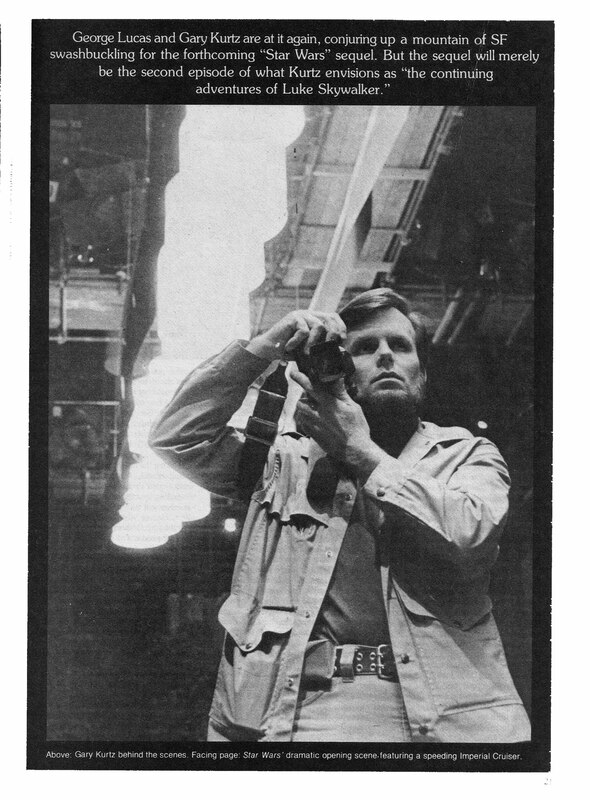 Producer Gary Kurtz told the author (Joseph Kay) that he and Lucas planned from the very start of the Star Wars project that there would be three stories which took place before the original Star Wars film (now called A New Hope), so they avoided ever referring to the sequel as Star Wars II. 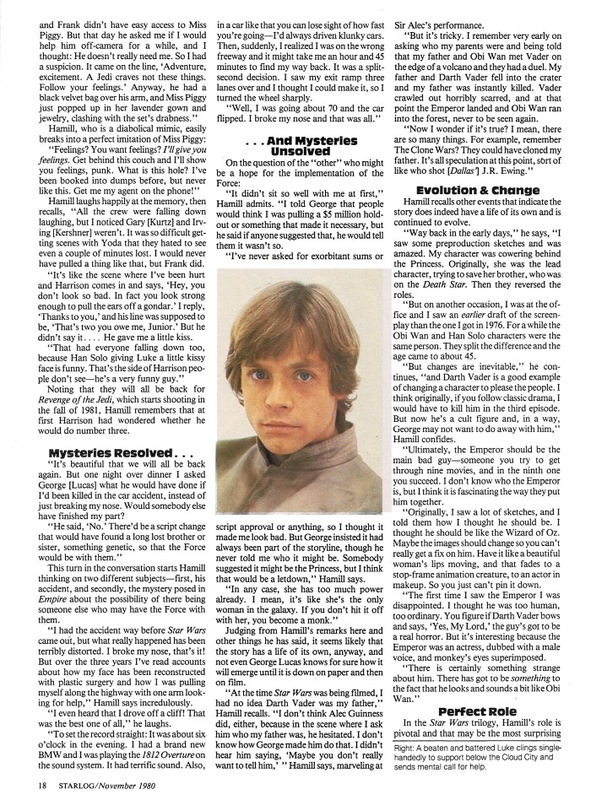 He also states that the “original brainstorming session” for the Star Wars films (well before the first one was made) included plans for twelve films (rather than nine) that were referred to collectively as The Adventures of Luke Skywalker. — as well as giving us an ending which couldn't have been more different than the happy awards ceremony at the end of Star Wars! Kurtz promised that there would be plenty action in Empire, with new FX techniques they were developing for the movie. I think they kept that promise! 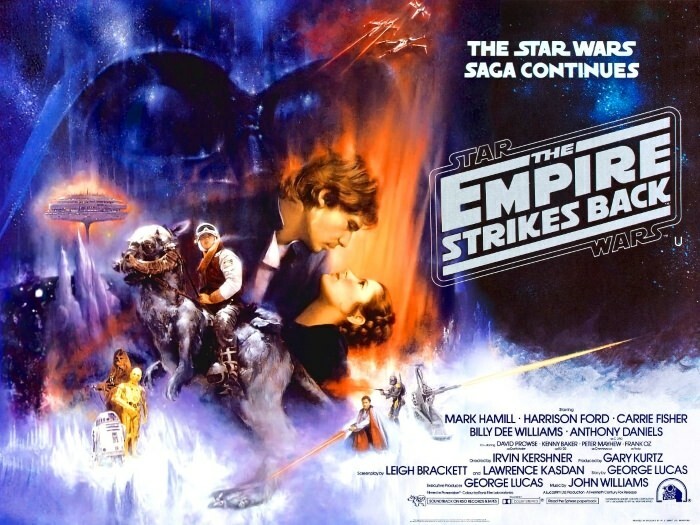 I was not aware until I read this article that the scripts for Star Wars and The Empire Strikes Back were written by Leigh Brackett, who passed away shortly after finishing the script for Empire. 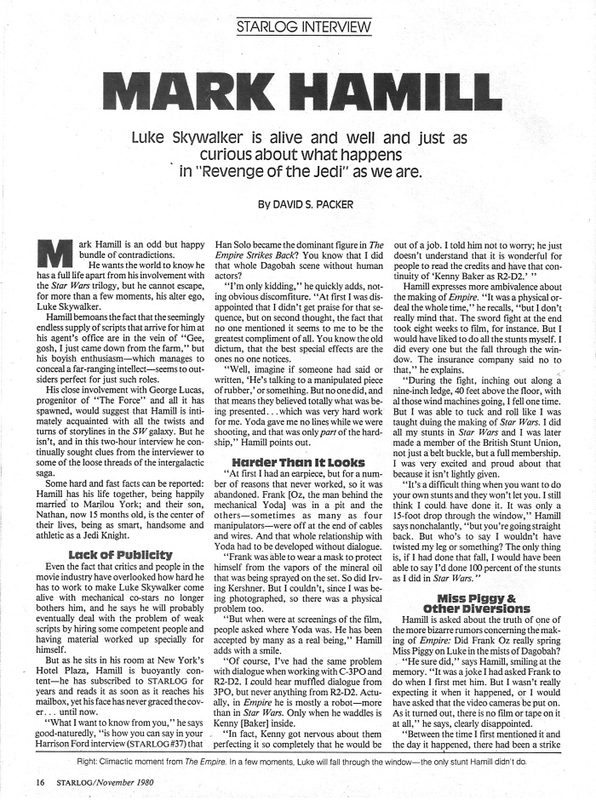 Kurtz states that “the romantic triangle [between Luke, Han, and Leia] is resolved in Empire". We know now that Han and Leia profess their love for each other, but we didn’t know at that time about Luke being Leia’s brother. Some folks doubt that Lucas had that in mind originally, but Lucas has claimed he did. Still, one wonders . . . Some folks doubt that Lucas had that in mind originally, but Lucas has claimed he did. Still, one wonders . . . I've long suspected that Lucas made up a lot of his plot specifics on the fly. He may have had an overall story arc in mind from the beginning, but too many elements come across as spontaneous. A wise man once said this. 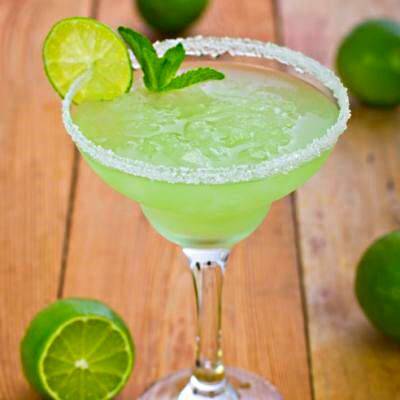 Life without spontaneity is like a Margarita without tequila. It's just a "virgin Margarita" — and if that ain't an oxymoron, I don't know what is!